The pressure to provide a vision of an alternative to capitalism is keenly felt by many of those who condemn it. This is particularly the case for Marxists, who find themselves confronted with the fact that Marx, seemingly deliberately, said very little about an alternative himself. 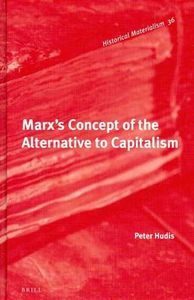 Peter Hudis believes that Marxists can and should take up this challenge, and he argues in this book that it is possible, and urgently necessary, to draw out a conception of an alternative in Marx’s writings, and to use it as a basis to develop a clearer alternative. Drawing on a wealth of material, much of which is overlooked by other commentators, he begins the work of uncovering this conception. However, whilst he makes a convincing and clear case for the presence of the outlines of such an alternative, Hudis is both too optimistic about how specific this alternative might be, and too pessimistic in accepting that an adequate critique of capitalism depends on such a specific alternative. A particular strength of Hudis’s book is that it examines the full sweep of Marx’s writings, rather than focus on one particular text or period of Marx’s life. No stone is left unturned in attempting to uncover the implicit conception of an alternative. The scope of this allows him to include a number of texts which are often overlooked in this discussion, and offer a number of novel interpretations of works usually discussed in different contexts. As part of this the book contains as an appendix a new translation of Marx’s Excerpt-Notes on the ‘Absolute Knowledge’ chapter of Hegel’s Phenomenology of Spirit. These, Hudis argues, provide evidence for a distinctive reading of the Economic and Philosophical Manuscripts as underpinned by a concept of an alternative to capitalism: “Marx’s intense focus on Hegel’s concept of self-movement through second negativity leads him to posit a vision of a new society that surpasses the limitations of other radicals on the scene at the time” (72). Marx’s alternative to capitalism, then, is one motivated by a concern to end the dominance of humans by abstractions. This can only be achieved through a structure in which human beings organise society consciously, and in which social relations become transparent. Crucially, this involves the transcendence of value as determined by socially-necessary labour time, which is the central abstraction which dominates life under capitalism. In a section distinguished by its lucid and able treatment of what is often extremely complex material, Hudis argues, plausibly, that Marx never suggested that a post-capitalist society ought to be governed by value determined by socially-necessary labour time, rather merely that its early phases would be characterised by value determined by actual labour time. Hudis clearly intends his work to be a sort of preparatory piece or groundwork for future development. Twice he refers to Marx’s work containing the “contours” (4, 101) of an alternative to capitalism, and clearly believes that within these contours a “specific alternative” (a term he uses frequently, alongside “specific conception”) is both possible and “of great importance” (5). This, I think, is mistaken. It is not that we can or ought to say nothing about a post-capitalist society. Hudis’ work is excellent proof that we can. However, I am significantly more sceptical about how much we are able to say, and about how much we ought to be required to say. What is at stake is how specific an alternative ought to be. This, I want to suggest, is not just a semantic or intellectual quibble, but one of real importance to the questions that Hudis addresses. Hudis repeatedly refers to the need for a specific conception of an alternative to capitalism, and that implicit in Marx’s criticism of capitalism is just such a specific conception. Yet how specific is specific? How much detail must we go into? How much detail can we go into? Do we specify rules of distributive justice, or detailed institutional structures and mechanisms? I want to argue that the answer to the question of how much detail we go into is ‘not very much’, and certainly may end up falling well short of what certain interlocutors demand. Rather than any specific conception, contours might be the best we can hope for, and the most we can expect. The reason for this can be found in the fact, which Hudis rightly notes, that “Marx opposes any tendency to project a vision of a postcapitalist society that comes out of the theoretician’s own head, independent of the struggles of the proletariat” (84). Hudis acknowledges that this condition, motivated by Marx’s concern for self-emancipation, places restrictions on the manner in which one can posit a conception of the alternative to capitalism. Yet it also, it seems to me, imposes a restriction on the conception itself. Loosely, the more specific a conception, the more we fill in the space between the contours, the more likely we are to create an image separate from the struggles of the proletariat, which ends up being imposed upon them. Furthermore, the more we attempt to fill in this space, the more likely we are to fill it with intellectual concepts not rooted in any alternative, but rooted in capitalism itself. However, the Paris Commune was not ‘the vantage-point of the future’ but precisely a vantage-point in the present. It was not the standpoint of having transcended capitalism, but a standpoint within capitalism which also helped point beyond it. Yet before the commune, such a standpoint was not available. With this in mind, we can legitimately question whether Hudis lives up to his own demand that “hard and continuous theoretical and philosophical labour that is rooted in, but not reducible to, the consciousness of the oppressed, is needed to help bring forth a conceptual alternative” (81). This hard theoretical labour will only be as creative and successful as the struggles it is rooted in; it is the depth, breadth and ultimately success of these struggles themselves that will furnish the theoretical resources for the alternative. In this context, it is worth remembering Marx’s definition of revolutionary practice as the “coincidence of the changing of circumstances and of human activity or self-changing”. It is this coincidence of social transformation and transformation of consciousness which is likely to provide the kind of detail that Hudis is looking for. To stress again, this does not mean we can say nothing about the future except in periods of heightened class struggle and revolution, merely to say that unless that struggle is successful, we cannot know more than the contours of the alternative. The task of filling in the space between the contours in thought goes hand in hand with the task of building the alternative in reality. Nor does it mean we cannot condemn capitalism at all. We should not accept the claim that we cannot criticise capitalism without a detailed alternative. It is enough to point to capitalism’s many ills, and to remind people of the powerful point that “Another World Is Possible”, without presenting every dot and comma of that world. In as much as his writings are directed to, and clearly rooted, in “the emergence of a global justice movement over the past two decades, which has called attention to the economic inequality, social instability and environmental destruction that have accompanied the global expansion of capitalism” (1) Hudis is on the right track. However, his demands for specifics seem to me misplaced, and potentially misleading. I appreciated Dan Swains review singling out Marx’s criticism of a “false inversion of subject and predicate” and “that Marx never suggested that a post-capitalist society ought to be governed by value determined by socially-necessary labour time, rather merely that its early phases would be characterised by value determined by actual labour time.” These are two conceptions that I believe are unknown to most Post-Marx Marxists. I find it somewhat ironic that Swain accuses Hudis of being too specific in his conception of an alternative to capitalism given that Hudis’s position was similar to Swain’s for most of the twenty nine years that I have known him. I don’t think we should wait for the movement from practice to solve this problem on their own, in fact given all the social movements taking place globally, I think they are forcing the movement from theory to meet them with a philosophically grounded alternative to capitalism. The class war being waged upon the working class by the rulers desperate attempts to redistribute value from labor to the so-called 1% through austerity measures is obviously one of the most compelling reasons for establishing a new society. An another example of what I’m talking about, Occupy Denver, one of the groups I’m involved with is trying to form an “Alternative Economies Working Group” out of the alternative economic co-operatives in the Denver Area, so far they have contacted “nine”. I confident you’re aware of the dangers economic co-operatives encounter with-in the confines of the global capitalist market. Finally, I don’t believe Peter Hudis’s call for a “specific alternative or specific conception” details “every dot and comma of that world”. The specific alternative or specific conception Peter Hudis is focusing on is what is essential to transform capitalist value production to “human” production. Member, International Marxist Humanist Organization. How to live as a socialist? well i don’t really know, but how to live like a capitalist that’s easy just watch ‘The Apprentice’ where two teams compete in various tasks under the watchful eye of Donald Trump or Lord Sugar and one individual is fired until one ‘winner’ is left, in a ten step process. In the true spirit of capitalism the first task is allways selling in the street, other tasks involve making a product or service, marketing, buying, creating a brand, advertising etc. If you have skills in the above plus good selling and presentation abilities and you are willing to ‘back stab’ and outsmart your fellow competitors you will go far in the process. Now the question is how will a TV program based on a ‘socialist apprentice’ look like?. What will be the ten step process?, what skills will be needed?, what type of person would be the host?. , what will be the format?. Answering these difficult questions will in my opinion give guidance to ,how to live like a socialist’.